The Upton Farmlands property today. The Canada Lands Company, the federal crown corporation that holds responsiblity for this land, wants to develop it for houses and businesses despite the fact there are nearly 300 serviced housing lots nearby ready for use. In effect, CLC wants to compete with PEI residents to sell real estate properties and profit from this land which was paid for by the taxpayers of Canada. The Nature Conservancy of Canada unveiled its Conservation Blueprint for the Maritimes earlier this week. The blueprint highlights areas that are not well protected. In P.E.I. and the rest of the Maritimes, coastal regions are a big concern, according to Philip Greyson of the NCC, who was quoted in The Guardian newspaper. “The coast is very much under threat from development but very important to the overall ecology of the Maritimes. The coast was one of the highest priority areas for us to focus our efforts and I think for everyone to,” he said. Greyson added that farming and housing development are also reducing significant areas of wetlands in the province, which are important to overall ecology of an area. The scarcity of land in PEI means that any opportunity to preserve a piece of the province’s natural heritage must be taken. The picture above shows the Upton Farmlands as it is today. The Canada Lands Company has plans to use this property for a housing development; indeed, would have proceeded already if it was not for protests from thousands of Islanders and organizations like the PEI Shellfishers and the Women’s Institute. 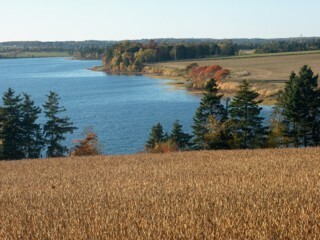 Please continue your support to the Upton Farm Preservation Network to save this priceless piece of PEI coastline. This entry was posted on October 26, 2007 at 4:55 pm and is filed under Environment, Raising Awareness. You can follow any responses to this entry through the RSS 2.0 feed. You can leave a response, or trackback from your own site. There is no development on the property now, but the Crown Corporation that now is responsible for the Upton Farmlands wants to develop it for housing. Please click on “Background of the Issue” in the website sidebar on the right for more information.